John Patterson bits give maximum comfort and top performance. The unique curved moth eliminates the nutcracker action of conventional bits, stops the bit from hitting the roof of the mouth and eliminates severe direct pressure on the bars and tongue. It allows plenty of room for the tongue and encourages relaxation. It's perfect for training and to get the top performance from your animals. 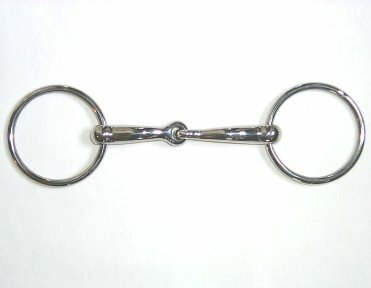 The loose rings on this snaffle are 3 inches and the mouth piece is 14mm (about ½ inch) at the cheek.